The book is about the public shaming that some people have been subjected to on social media. He provides some case studies of people whose lives have been significantly changed by a single post on Facebook or Twitter. These individuals aren’t always celebrities – some had just a couple of hundred followers. These case studies set the context of the post right up to modern day consequences for the user. The book begins with an example of Jonah Lehrer who quite simply, made some stuff up for a book. The author was outed by another journalist. This sets the scene for the rest of the book – all quotes from all interviews are meticulously precise. Each case study leads nicely on to the next one, and several intertwine. This makes the book easy to read and creates momentum. It’s rather like George Lucas’ story telling technique in Star Wars, with each storyline having three or four scenes running in parallel. I read the second edition of the book, which includes an additional chapter of Ronson’s personal experience when he released the final draft of the first edition. He found himself defending an angry mob criticising a specific paragraph in the draft (which he justified and then kept in the print edition). I must confess that when I read the offending paragraph I was surprised at the anecdote he used, but nothing more than that. Others clearly found it more offensive. While reading the book I was already recommending it to colleagues who are engaged in social media, as well as my kids. I thought it served well as lesson in “be careful what you post”. In the additional chapter Ronson said this he received the same feedback from others after the first edition had been released, and this was not the message he was trying to get across in the book. His message is that when you witness someone being shamed on social media, don’t join in the angry mob, and even try to calm the situation if possible. I finished the book on Bank Holiday Monday (after Easter). The next day, an aeroplane was hijacked from Egypt by Seif Eldin Mustafa wearing a fake suicide belt. 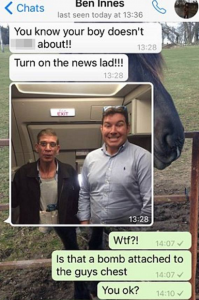 On board was a British man called Ben Innes who in the last 24 hours has become more famous than Mustafa because he was photographed in a selfie-pose with the hijacker. Twitter erupted. 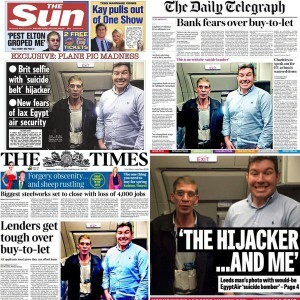 Front pages of UK newspapers with Ben Innes. Perhaps we should spare a thought for how Innes might be feeling? I thought about So You’ve Been Publicly Shamed and wondered what to do. (It’s worth adding at this point that I don’t think I’ve publicly shamed anyone, or any organisation, on any social network. If I have, I am sorry and I will delete the offending post). I started wondering why Innes posted the selfie (strictly speaking it’s not a selfie because he didn’t take the photo himself, but the photo has all the pose and framing of a selfie). Playing Devil’s advocate, perhaps Innes thought that taking the photo would reveal vital information about the hijacker to the authorities? Perhaps this was Innes trying to act as an inside-the-aeroplane camera feed? Ronson makes some good points – on social media it is so easy to criticise and upset people with vicious attacks, so let’s make social networks a nicer place by calming down a little and watching what we post, and how we react to others.